Today marks the US release of the small-town creature feature Dark Was the Night which promises to provide so much more than your garden-variety monster movie as the film’s scribe, Tyler Hisel pitches it as a family drama that also just happens to be a creature movie. 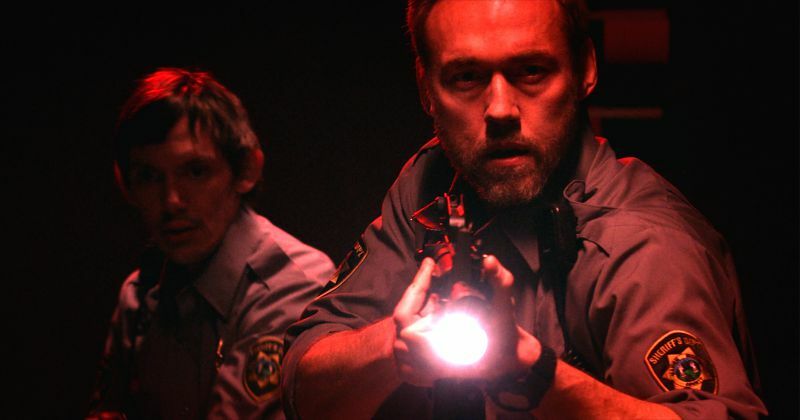 Helmed by Jack Heller and starring Kevin Durand alongside the likes of Lukas Haas, Steve Agee, Nick Damici and Bianca Kajlich, Dark Was the Night is set in the secluded and peaceful town of Maiden Woods where the local community is shaken up following a spate of increasingly violent and incomprehensible events. The already afflicted Sheriff Paul Shields (Durand) and his deputy (Haas) struggle to confront their own personal demons whilst being forced to make a stand against a new breed of terror that is possibly older than humanity itself… And much, much hungrier. Tyler Hisel: I was – and still am – a big nerd for all of that stuff like Bigfoot, the Jersey Devil and UFOs. I just kind of grew up fascinated by all of that stuff so I knew of that story for years and I looked at that little community and I was fascinated by their response. So the idea was basically what if, rather than a sleepy little town in England in the 1800s, it’s a sleepy little town in America today? I don’t think the community’s response would be all that different. From there it was a question of what other elements I could mine out of all these elements of folklore to give some texture to this and to create something we’ve never seen before. I also always jokingly pitched it as a family drama that just happens to be a creature film. We always wanted it to be a character piece about this family at the centre of a crisis of going through loss and mourning the loss of a child and to let that be the heartbeat of the story. Then the creature element is something that tightens those screws and puts more and more pressure on this man who is suffering this identity crisis, a guy who doesn’t think he can be a protector anymore and suddenly he has to be in the most extreme of circumstances. 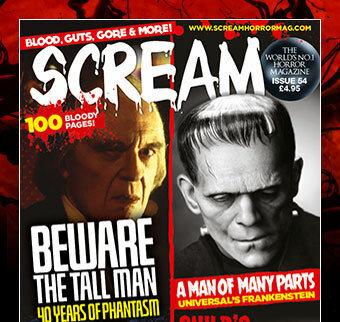 SCREAM: How did your script reach Director Jack Heller’s hands after it made it onto the Hollywood Blacklist in 2009? TH: That’s a long winding tale [laughs] but I moved to LA and this was a script that I wrote the first draft of in college so it was the script I had in my back pocket when I moved to Los Angeles from Kentucky. I landed in LA and it was a script that I kept working on until I finally crossed paths with a literary manager by the name of Alex Robb who humoured me and read the script and dug it and we developed it from there. Alex Robb: The machinations of how you get attention for any property you have in your stable is all about getting people to pay attention in realistically focusing on the potential of what the property brings to the table. That’s where we spent a good nine months developing the script and once we had it in a pretty good position we presented it to as many producers as we possibly could. People recognised the quality of the writing, the suspense, the character work and they ultimately supported it and put it in a position where others would also notice it. Eventually at Caliber Media I had a friend who used to work with Jack in Dallas so they got a hold of the script and instantly fell in love with it. They basically said, “We’re going to make this movie!” and it was very clear. They had a lot of intention of committing to that. A lot of people will say that they want to do something and then they don’t do it but they were very committed to getting it up off the ground from the moment they read it. Ultimately I think we submitted it to well over 100 different companies with various people taking interest over the course of probably about 2 years of pushing the material to various folks. TH: A lot of that, Howard, just to clarify the reason it was shuffled around quite a bit, I think was because we were doing something that didn’t fit in a box as it wasn’t a clean monster movie or anything like that. We were in this unique space, which is great, but from a studio perspective that’s a hard movie to do. But Jack got it straight away and once he recognised what it was we were so happy to have partners who got it and who weren’t trying to force it into a box that it didn’t need to be in. AR: One of the primary goals we had with this project – and it was on the page from the start – was to have the ability to have been able to do it for 100 million dollars or for 10 million dollars. There was some nice scalability so when Jack got hold of it staying focused on the characters ultimately made it more of a piece that was about family and not about the blood and guts and the thrills and the chills. The suspense ratchets itself up and builds and builds to a grand conclusion but in that process you have resources that you have to work with. When you are doing an independent movie, as much as you may want to do certain things, you have to be pragmatic and practical but stay focused on the value of what the movie is all about, which is family. SCREAM: How hands-on where you during the casting and filming processes? TH: Alex and I were both on set at different times during the process. Caliber and Jack and his partner Dallas Sonnier very much took the lead in the casting and they did a spectacular job as you can see from who is in the movie. 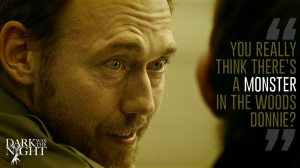 We’ve got actors like Kevin Durand and then also Bianca Kajlich who is just going to blow people away in this movie. A writer’s job on set is just to kind of be on call and you’re this guy who floats and has the laptop at the ready to deal with any issues that arise. SCREAM: Without giving too much away, you had a great special effects team so can you give us a rough idea what kind of monster audiences can expect? AR: Tyler, let me just throw one thing in there real quick! Audiences can expect something unique that’s ABSOLUTELY TERRIFYING. There has been nothing like this before, period! That’s the first thing they can expect. You’ll see something original, completely original and that’s so rare these days because everything’s a remake. TH: We wanted to do something that wasn’t like, “Oh it’s clearly a werewolf or it’s clearly a Yeti.” We looked at all these legends that spanned thousands of years and thousand of miles and we said, “What if there is a commonality here? What if there was a core kernel of truth to all these myths and these legends of things walking in the woods? What would that commonality look like?” So that was what we went with. What would leave biped hoof prints but at the same time be able to climb, be able to run and kill and hunt and hide? 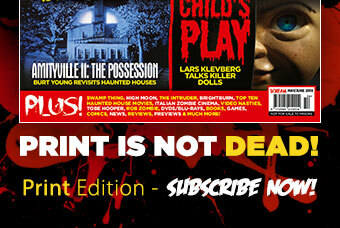 SCREAM: So Dark Was the Night is out on Friday but have you got anything else on the go as we speak? TH: Alex has ALWAYS got a bunch of plates spinning but I do have a show called “Liberty, Alaska” which is a TV pilot series that was recently sold to A&E Studios about an armed militia group in the remote woods of Alaska. It’s another kind of monster in the woods story but these monsters happen to be people. We’re hoping to get that set up on a network here soon. Then beyond that, the funny thing about writing is that people get to see things you were working on 5 years ago so thankfully we have a number of things in development. We have a feature property in development with an A-list star that we’re very close to attaching that we can hopefully talk about soon. AR: One of the things that we really endeavour for is quality on the page which takes time. Looking at the world of film today, one of the big driving forces is how to sell a property and create a marketing hook. We pay attention to that of course but it has to be quality through and through because when you show people the brilliance of a great script that can lead you to the position where you don’t need to remake something or take a book and adapt it. We have a lot of plates that we’re spinning but at the end of the day, no matter what it is that we endeavour to do, we want to make sure that the quality is on the page first and foremost. SCREAM: Tyler and Alex thank you so much for your time talking about Dark Was the Night and we wish you the best of luck with the film. TH/AR: Fantastic, Howard. We appreciate you taking the time. Dark Was The Night is released on VOD, iTunes and in select American cinemas today, July 24th 2015. In the meantime we’ll leave you with the trailer which is sure to grab your attention.